Buy Polyurethane wheels from Caster Barn, Polyurethane on Polyolefin also known as Poly Pro Wheels or Poly-Pro Wheels. These Poly Wheels come on a stainless steel Caster assembly, choose from swivel or rigid and multiple color options. Caster HQ's stainless steel version is of one of our most popular series offering the same advantages of quality, durability, and economical pricing in comparison to other brands. All metal parts of this series are made of 304 stainless steel, especially made for sanitary applications and long service life; offering exceptional resistance against rust and corrosion and are 100% washable, steam cleanable and safe for use in autoclaves when applicable wheels are used. These casters are commonly used in the following industries: food processing, food service, laboratories, hospitals, institutions, pharmaceutical plants, and other applications that require casters to be washed down and cleaned on a frequent basis. • All metal parts are 100% 304 Stainless Steel. • Stainless Steel extends service life & offers resistance against rust & corrosion. 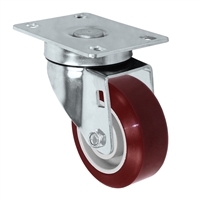 • Casters are autoclavable when used with applicable wheels. • Double ball raceways offer improved swiveling action and durability. • Fork and leg assembly designed and formed for maximum durability and long term service. • Optional hollow kingpin offers 8 additional hard to find stem fasteners. • Large selection of wheels & options to choose from. • 3/8” Axle & nut. • Exceptional availability = quick deliveries.